Tuesday, March 12th, 2019, 12:00-4:00 p.m. The Eat Colorado Food Show is back for its fourth edition bringing Colorado’s diverse and innovative food and beverage producers together with buyers from restaurants, caterers, grocers, hospitals, municipalities, and school systems to create more connectivity, understanding and meaning within our dynamic food system. 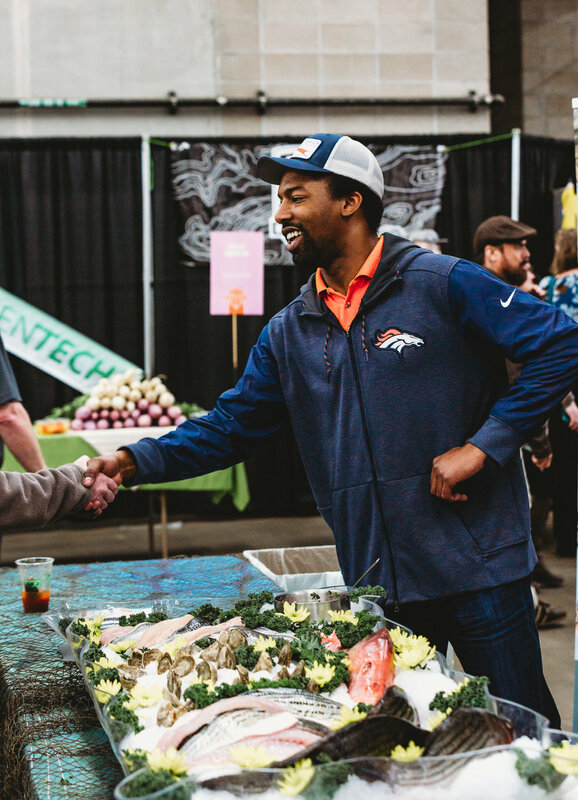 The Food Show will showcase Colorado produce, grains, meats, preserves, condiments, honey, spirits, wines, beers, baked goods, and more, with over 120 producer booths. Don't miss the Speaker Series inside the Expo Hall Bar & Grill. Free Parking is available on-site in Lot A. Attendance for the Food Show is free – register below! Colorado farmers, producers, and distributors will be displaying products and providing samples to buyers from around the state. Join us to make new business connections and expand your consumer base. Registration has closed - we hope to see you there as an attendee! Sign up below. Whether you're an F&B industry member, producer, media member, or a food lover of the general public, attendance is free! Sign up to discover new purveyors and enjoy food and drink from around Colorado. Meet four non-profit organizations who are strengthening Denver-area communities through food. Learn about the different ways each organization—Re:Vision, The GrowHaus, Focus Points, and Slow Food USA—approaches community empowerment and food, and the challenges they face along the way. Todd Leopold - Co-founder, Leopold Bros.
As our standards for sustainable agriculture change rapidly, meet four nationally-recognized leaders who are pushing the status quo in their fields: a James Beard-nominated distiller focused on resource efficiency, one driver behind Colorado’s organic cannabis industry, and a thought leader in regenerative agriculture and natural beef. We’ve heard it through the grapevine; the Colorado wine industry is having a breakthrough moment, receiving banner national recognition for its quality and innovation. Ashley Hausman MW and Scott High, founder of Classic Wines and Colterris Wines, are here to tell you why and how, and to guide you through a tasting of some of our state’s change-making sips. This workshop has a limited number of seats; please pre-register through the link above.